What do you think would happen if a Pastor or worship leader or a choir director decided to sing one of those classic Christmas carols, like "God Rest Ye Mary Gentlemen" or "It Came Upon Midnight Clear," ...on Good Friday!? It wouldn't likely go over very well with the congregation, especially those more protective of traditions. And that's ok because not very many of those Christmas carols would at all be appropriate for Good Friday. Good Friday is the day on which we remember Christ's torture and death. It is there that we emphasize Christ's solidarity with human brokenness and God's shared identity with ones who suffer. It is there that the darkness is remembered, acknowledged, brought into the light. So those lines from Christmas carols--lines like "Joy to the world! The Lord is come"--which are so celebratory and joyous, would almost surely insult. They'd be offensive to the spirit of any normal Good Friday service. Zechariah's culminating proclamation of what God's work in Jesus will be about, indeed an anticipatory Advent proclamation, is quite aware of darkness... "to shine on those living in darkness and in the shadow of death..." During Advent, we anticipate the light, and yet what kind of a light is it but a light that shines in darkness? What child is this? Where should we look to discover the object of that carol which proclaims, "this, this, is Christ the king!" Should we look to the manger? Of course. 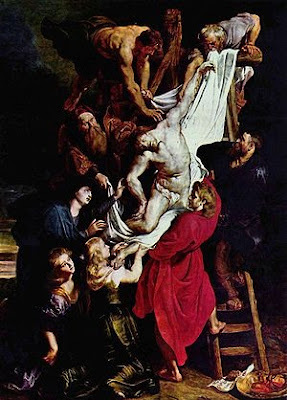 But should we not, more decisively, look to the body hanging on a cross? "O come, o come Emmanuel, and ransom captive Israel." Well, where is the most powerful and profound manifestation of Israel's captivity, of the dehumanization of God's people? Where other than Golgatha, where the God who is for us truly became God-with-us--with us even in our utter despair and abandonment? If we want to understand the incarnation, God's taking on flesh and blood and entering into even the darkest places of human experience so as to bring light and salvation there, the place we should look is foremost the cross and not the manger. The manger is and always has been about the cross--not that Jesus was here just to die in some arbitrary way, but that Jesus came to tear down all the walls between God and people, even the walls of Hell itself! When we sing, "...The Lord is come! ", we have to ask what sort of Lord is this, how does this Lord exhibit lordship? And we must remember that the most decisive moment of incarnation takes place of the cross. The decisive moment of the incarnation is the crucifixion (of course, the climactic moment is the resurrection... Though the resurrection precedes the cross, I believe. But here is not the place to get into that). The one on whose head sits a crown of thorns; this, this is Christ the king! Though the baby laying in the hay may be more palpable to us as the object of our exaltation, the same proclamations made over the child in the manger must be made, even more fundamentally, over the bleeding body of the man in Jerusalem. The irony is thick, but hear it!... It is by the cross that Jesus is exalted. It is by his death that Jesus brings life. It is in the darkness that Jesus is revealed, the light of the world. Jesus makes our suffering his suffering. Jesus makes our experience his experience. Therefore, we can share in his suffering and his future can become our future. His resurrection is our resurrection. The chains he breaks are our chains. Our story can be caught up in his story. So when we sing, "chains shall he break, for the slave is our brother," we must look forward to the cross and hear God speaking these words over us. That is what we anticipate as we wait in the Advent season. We await God's saving solidarity with us. We await the liberation and exaltation that comes even in the darkness. Her king hangs on the cross, her king suffers with her in her bitter darkness, her king is Christ Crucified. Let not the manger be divorced from the cross.